Ahh yes.. Barbecue.. Perhaps my favorite food group. I'm going to be the first to admit that I have a weakness for food that is prepared in this highly esteemed method of cooking. 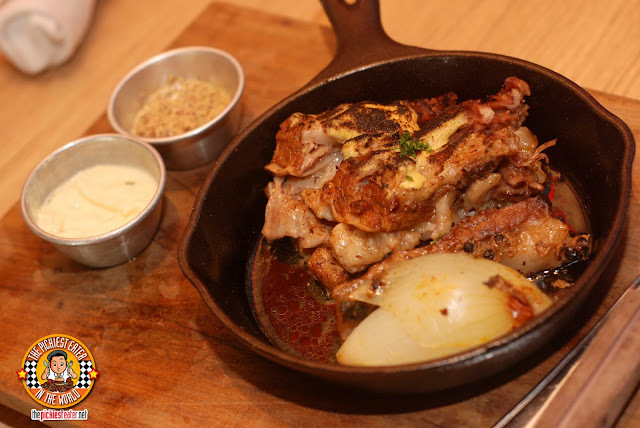 From Barbecued meats, to the different types of sauces, it matters not. I love them all. A couple of weeks ago, a childhood friend of mine, Chaveli, posted a picture on Instagram (follow me, pickiesteater!) that showed "Steak & Bone Marrow Tacos" from a Restaurant called "Cue: Modern Barbecue", with the apt caption, "Heart attack on a plate'. Chavs explained to me that it was a new restaurant at Bonifacio High Street that was opened by couple of our childhood friends from Cebu, Jon and Pebbles. I hadn't been to Bonifacio High Street Central since my trip to Jamba Juice. I know there are a lot of restaurants that have opened there, but I haven't had the time to make a trip there. I had a visit to Village Tavern that is scheduled there soon, but it kept getting thwarted by Baby Rain's yaya that never returned *grumble*. The beautiful interiors reminded me of a sophisticated, almost elegant Ranch. In my opinion, it effectively captured the feel of the theme of the restaurant, "Modern Barbecue". 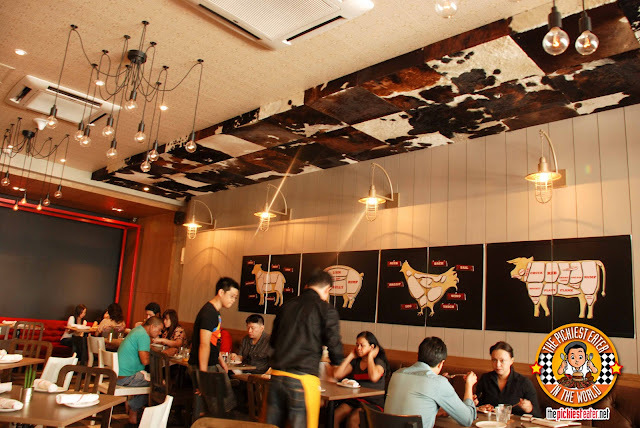 On the wall, diagrams of different cuts of meat were proudly displayed on the walls, and various cowhides adorned the side of the ceiling. The service was impeccable, with the waiters very knowledgeable with the menu, and extremely helpful in helping me choose what to order. The dishes were served within minutes of ordering. For a restaurant opened for less than three months or so, that was pretty impressive. 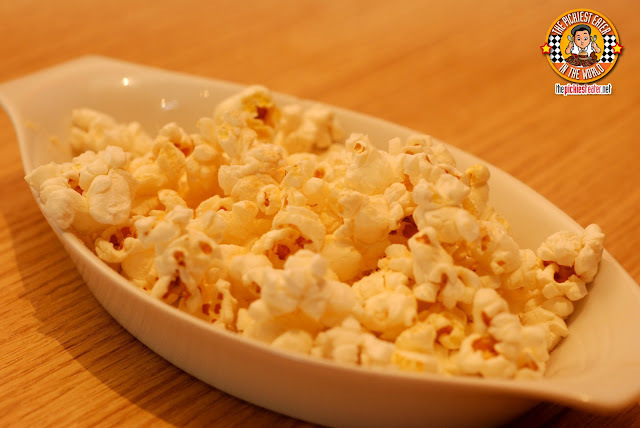 Instead of free peanuts, Cue offers popcorn as a free appetizer. The popcorn seemed to have a light dusting of a little chili pepper to give it a slight kick of heat, but nothing too overpowering. I get unlimited free popcorn at work, so popcorn is actually no big deal for me, but Rina's addicted to the stuff. By the texture of it, you could tell it wasn't freshly popped, but It was a bit addicting nonetheless. 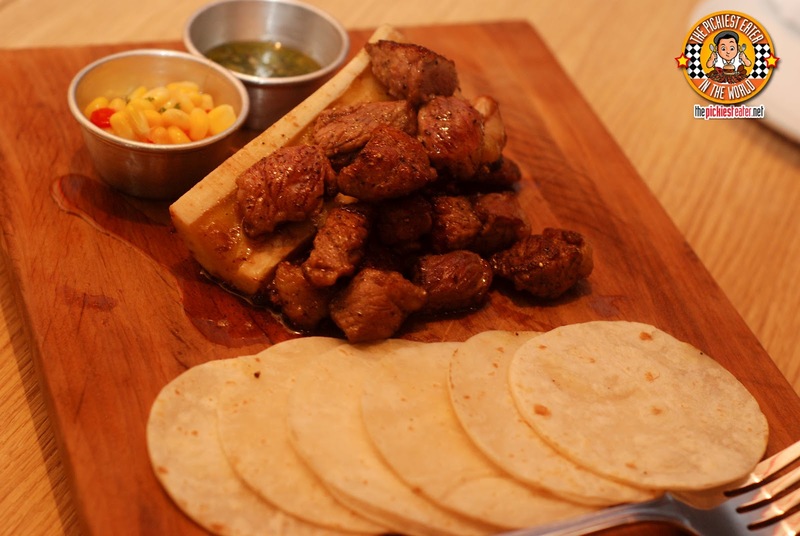 The Steak and Bone Marrow Tacos (P485) arrived, and man was it a spectacle to behold. 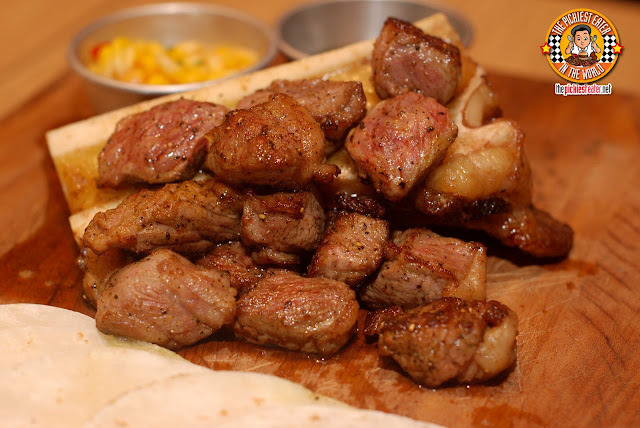 Beautiful chunks of steak, resting against a sliced bone, with a rich, glistening bone marrow lining the center. The dish comes with a side or roasted corn salsa, salsa verde, and six mini soft taco tortillas. The steak itself that they had wonderful trimmings of fat on it and were amazingly tender to the bite. Rina felt it was a little bit underseasoned, but I think it wasn't anything a bit of salt and pepper couldn't cure. I'm not sure how it's supposed to be done, but what I did was I piled the steak into the soft taco tortilla with a small slice of marrow, then topped it off with the corn salsa and the salsa verde. It was amazing. 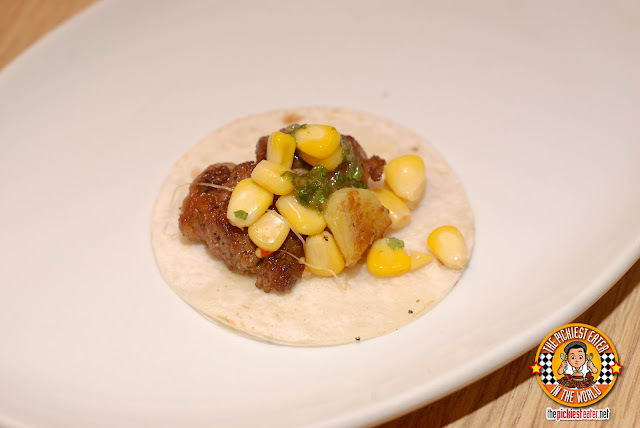 The flavor of the beef and the the spices in the salsa verde and corn salsa melded beautifully together into the mini taco. The fattiness of the marrow just melted in your mouth. Word of advice though, eat it right away. Don't give the marrow a chance to harden and make "Sebo". First off, let me just say that my heart broke into a million little bitty pieces when the waiter, Ace, told me that the Bacon Slabs I saw on Cue's menu posted on their facebook website, wasn't available yet. It threw me off and I couldn't decide what to get in its place. I'm a sucker for a good pulled pork sandwich, so I decided to go with Cue's version.. 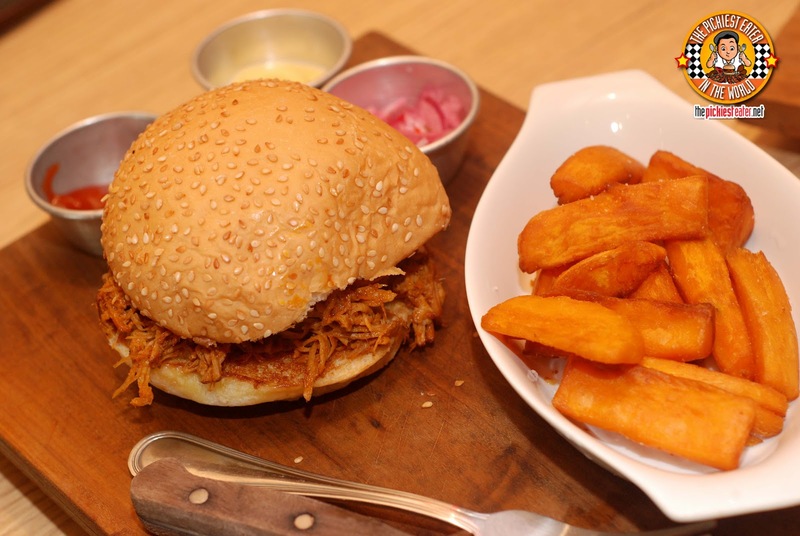 The Homemade Pulled Pork Sandwich (P310). 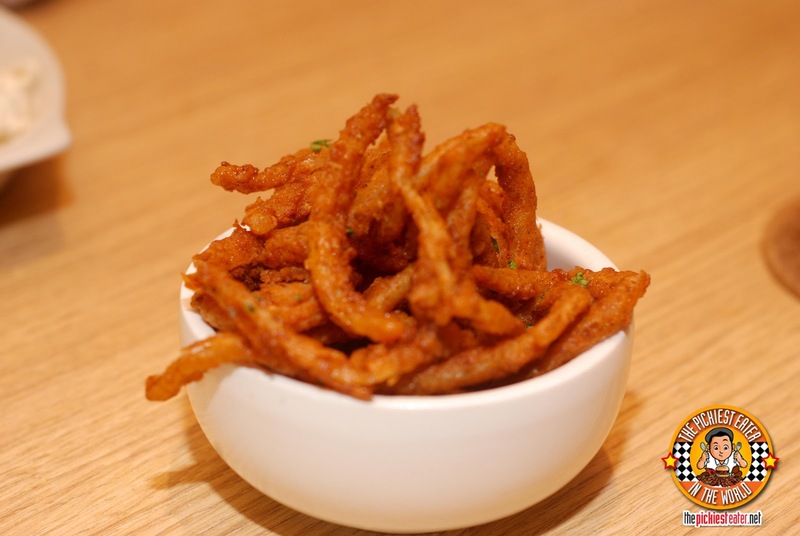 First off, I MUST mention that the dish comes with a wonderful batch of Sweet Potato Fries that have a delicious sweetness to go with its delicate crisp. Rina isn't into kamote so much, so these bad boys were all MINE. Also on the side, is a bit of Ketchup, red cabbage, and garlic mayo. 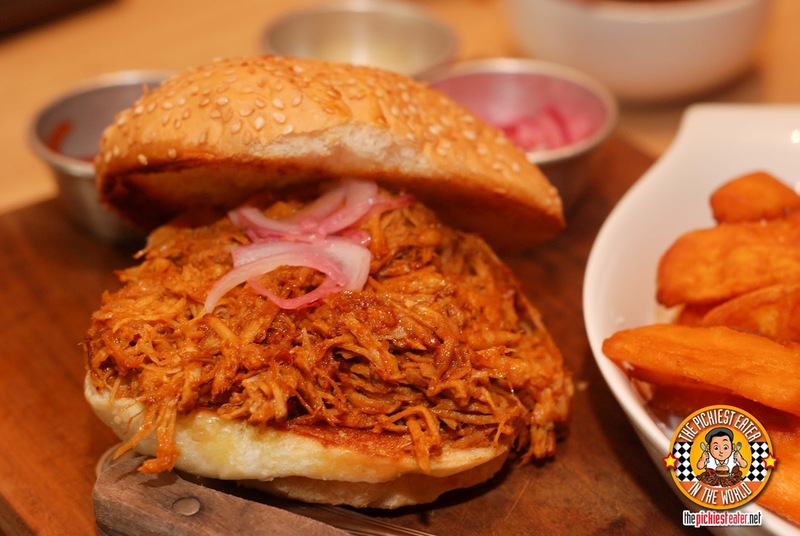 The pulled pork was overloaded into a soft, toasted bun. What I enjoyed about the meat, was that it didn't have the strong, acid flavor usually found in pulled pork. Don't get me wrong, the tanginess of pulled pork was still present, but it wasn't too overpowering. I eschewed the ketchup and went with the garlic mayo, which had a creaminess that was a nice counter to the light acid of the pulled pork. With everything we ate, Rina managed to finish only a quarter of the sandwich. Naturally, taking into consideration the thousands of starving children in Mongolia, I stepped up and finished her remaining portion.. after I finished mine. I was debating between the Beef Belly or the Lamb Ribs, so I asked Ace which was fattier. He said that both had generous amounts of fat in it, but said that the Beef Belly was one of Cue's best sellers, because of its amazing softness, so I decided to give that a try. The platter placed in front of me consisted of a small iron skillet, with a gorgeous slab of sliced beef belly in it. The beef is bathing in a pool of its own juices beside a beautifully roasted onion. 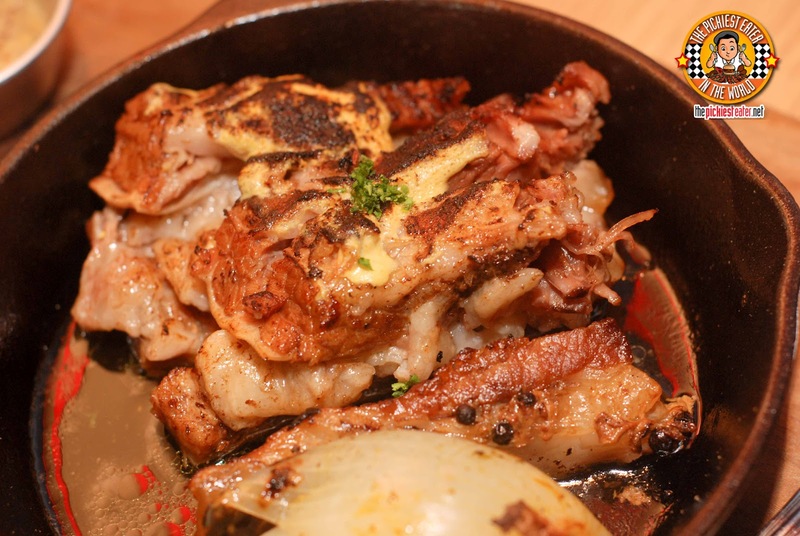 The Beef is braised in a Dark Ale, and encrusted in yellow mustard, with its top charred beautifully. Ace was right about it being fatty and incredibly tender. Between the two side sauces that it came with, a mustard based, and a garlic based, I preferred the garlic one. This was a phenomenal piece of beef. 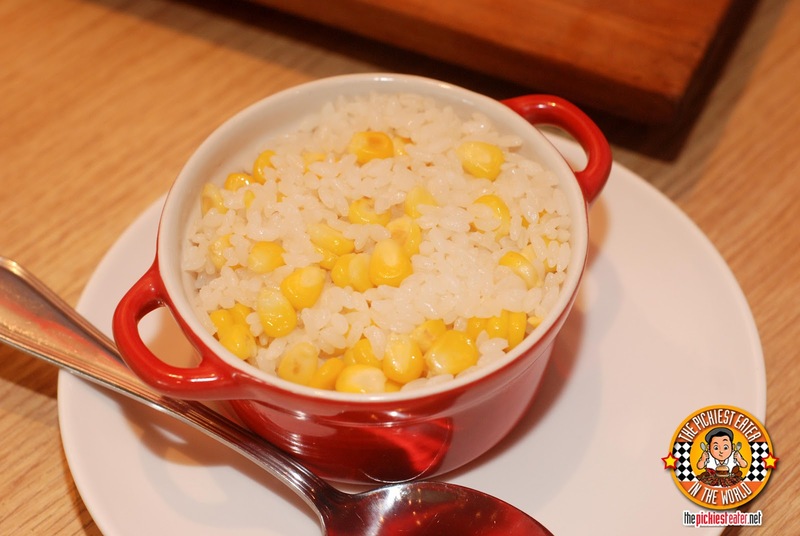 I was given a choice for a side dish, and I selected the Corn rice for Rina. This had an abundant amount of corn which brought a nice hint of sweetness, which was a nice companion to the savoriness of the Beef Belly. 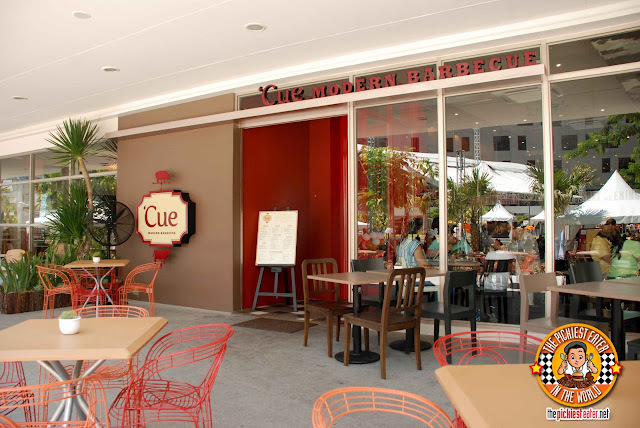 Cue: Modern Barbecue is a restaurant that seems to have been tailor made for my palate. I loved every single thing I ate here, and every time I look at the menu, I always find a new item that I want to try. I would happily recommend Cue to everyone who enjoys a great Barbecue, however I will admit that it's a bit pricey. The three dishes I ordered (and one side), was among the most expensive I've spent in my short career as a Food Blogger. 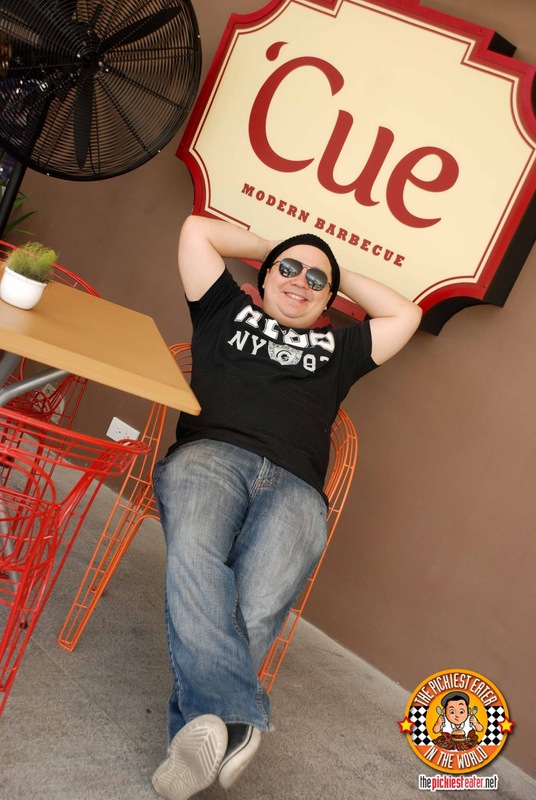 Congratulations, Jon and Pebbs, and to the rest of the group behind Cue: Modern Barbecue! You've got something awesome going on here.. I hope to see more branches! Oh and Please let me know when the bacon slabs are on the menu! I'm definitely going back for those bad boys! 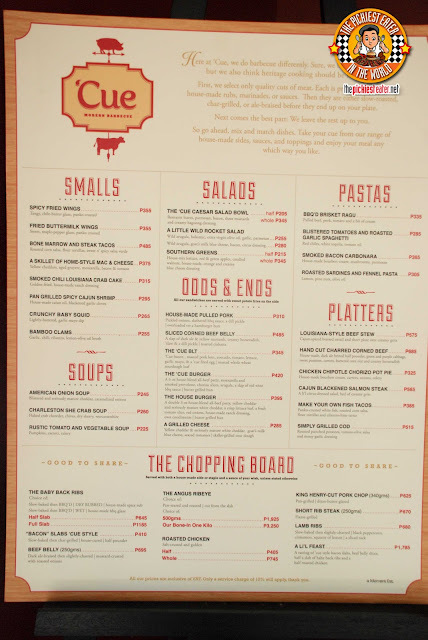 I'm going back the second they have the Bacon Slabs on the menu hehe.. I agree with ya on the Dream restaurant.. it's like a Barbecue lovers Paradise! Village tavern is next! What did you have there? Now that looks like some dead-serious meat there - and I am positively drooling over your description of the beef ribs. It makes me want to run right over to 'Cue soon as the paycheck clears! haha I'll go for the beef, you can have all the beefcakes!! Haven't tried bone marrow that way before. Might try some when I pass by Boni. Excited to try it tomorrow! Wahoo! It's really my fave resto right now!! Excited to go back! And now I know where to go for my next monthsary (what? i'm a girl). :) I love the way you write about these things! Hi Barbie! We met at Best Food Forward, right? How ya been? I hope you enjoy Cue! Yes, we did. I've been good, thank you. I hope you and your family are well too. Happy Father's Day! We're taking my dad here today. ;) Hope the lunch rush is over.